The Briars is a 230 hectare property run by the National Trust. 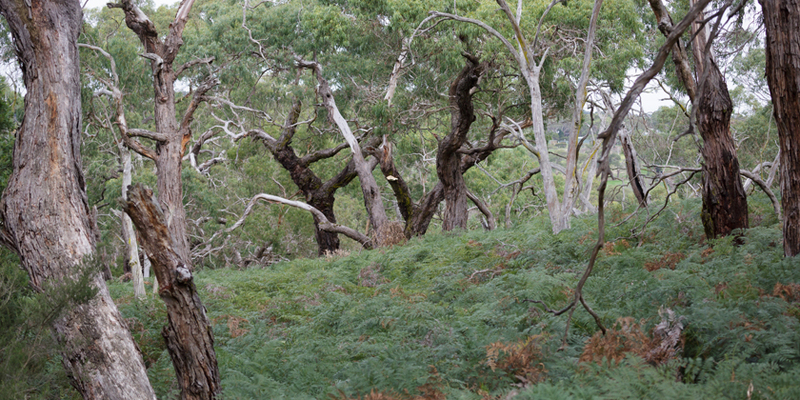 It is part historic farm and part natural bush. Detailed information about its history and what to expect when visiting is available at http://www.nationaltrust.org.au/vic/TheBriars and at http://www.mornpen.vic.gov.au/leisure_tourism/the_briars. The photo at the top of the page shows an old cart on display in the grassy area between the Visitors' Centre and the Homestead. May 2015. The beginners group of BirdLife Melbourne returned to The Briars after having visited in May 2015 (see below). The plan was similar to last year's, but in practice varied because of the weather. The first hour along the Woodland Walk was fine, but then there was rain. Wonderful to have it, but it limits birding and means the birders get wet. Some people were too soaked to stay for the whole day, but the rest of us ate lunch under the veranda of the Visitors' Centre and went for a pleasant afternoon walk in the farm and homestead areas under clearer skies, for a time. 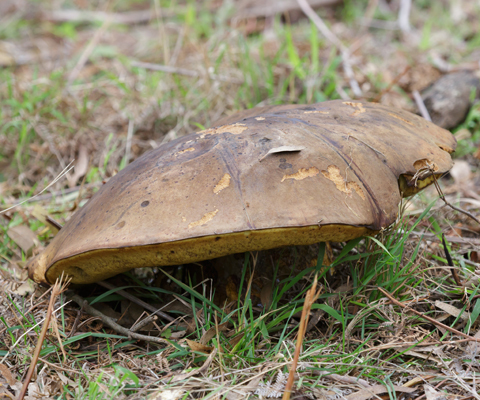 This year we recorded 51 species, just one more than last year. The above photos were taken in the swampy area along the Woodland Walk after we visited the bird hides and before the rain started. The sky was already grey. 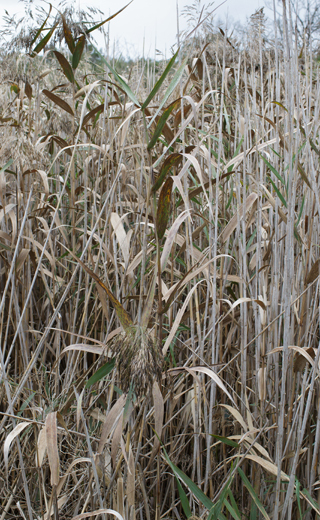 Left: Common Reed Phragmites australis. 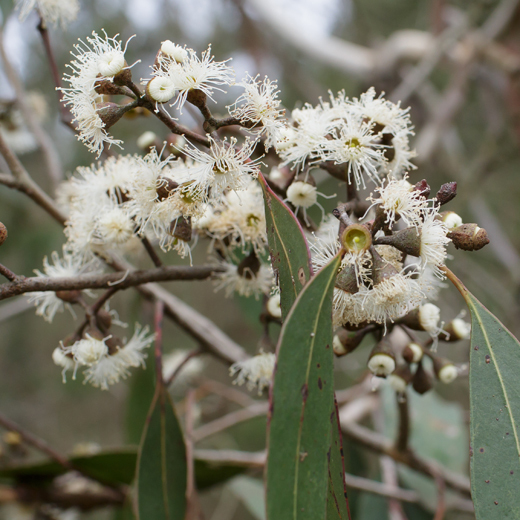 Right: Swamp Gum Eucalyptus ovata in flower. Birds in this area included New Holland Honeyeaters and Little Wattlebirds. 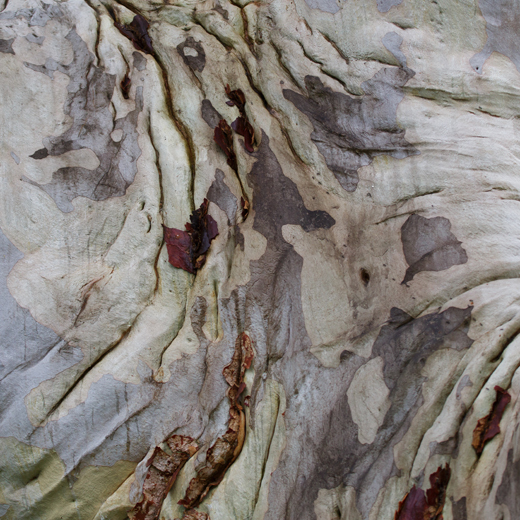 On our afternoon walk along the HIstoric Homestead Walk, we passed large trees with patterned trunks. 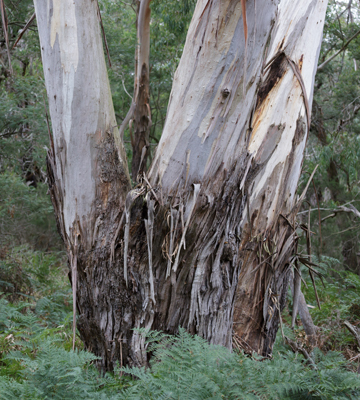 Left: Part of the trunk of an old wrinkled eucalypt. 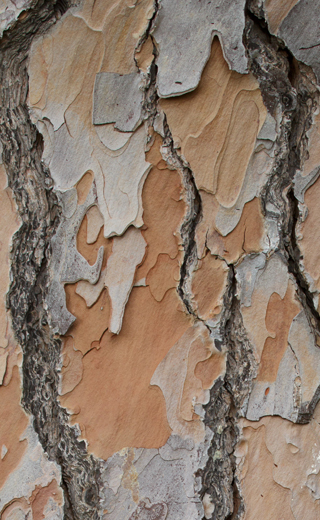 Right: Section of trunk of one of a number of pine trees. These are Stone Pines Pinus pinea; they are also known as Umbrella or Parasol Pines, no doubt because of the form of the branches. Thanks to Sue, The Briars Information Ranger for providing the identification. Numerous Sulphur-crested Cockatoos and a few Little Corellas sat preening, high in the branches of the pines. A couple of Stone Pine trunks can be seen behind the cart in the picture, taken last year, at the top of this page. The cart was surrounded by an orange plastic mesh fence this year. 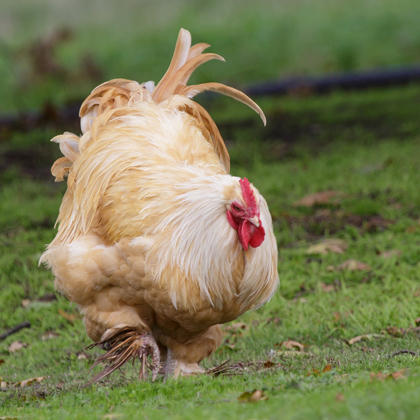 Cochin rooster, heritage breed, in the farm area. 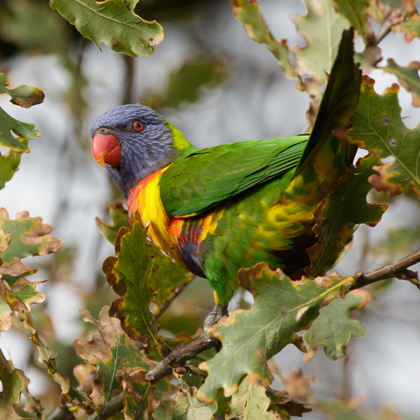 Rainbow Lorikeet feeding in an oak tree in the farm and homestead area. 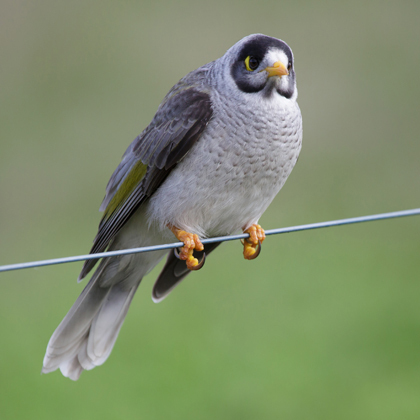 Noisy Miner poised on a fence wire. 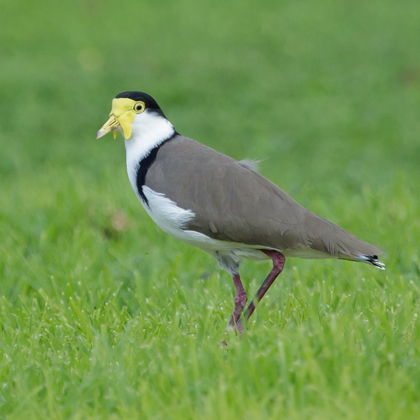 Masked Lapwing on open grass. 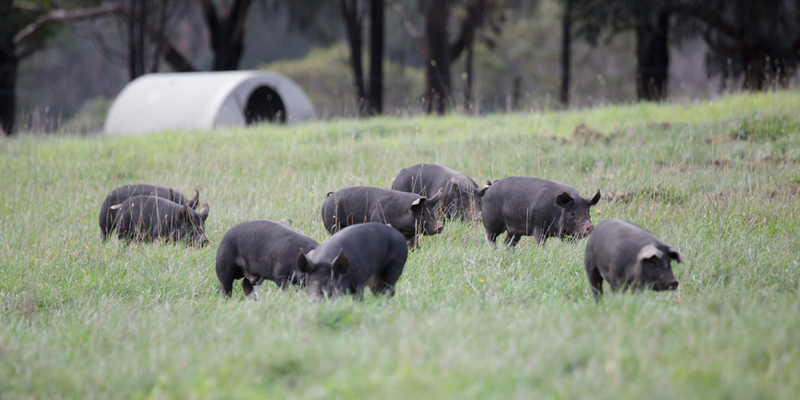 When we walked past the pig paddock, lots of young pigs came racing over to greet us, noisily. This one looked happy to see us. 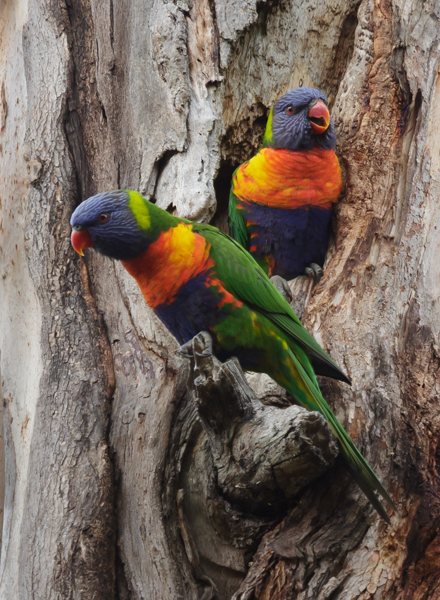 The beginners group of BirdLife Melbourne visited The Briars in May for the monthly outing. After a cool and cloudy start, the sky eventually cleared for the afternoon. Beginning near the car park, the group spent the morning in the bushland area, first visiting the Ken McArthur Wetands, including the Boonoorong and Chechingurk bird hides, and then following the walking tracks. Signs along the Woodland Walk Loop provided information about the habitat in general and plants in particular. 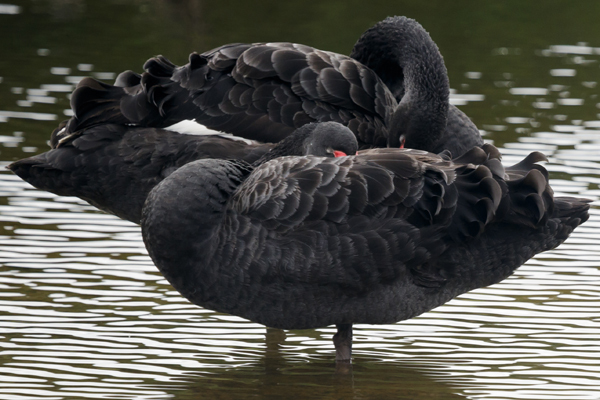 Although it was still four weeks until the shortest days, there was evidence of spring approaching with pairs of birds examining nest hollows. 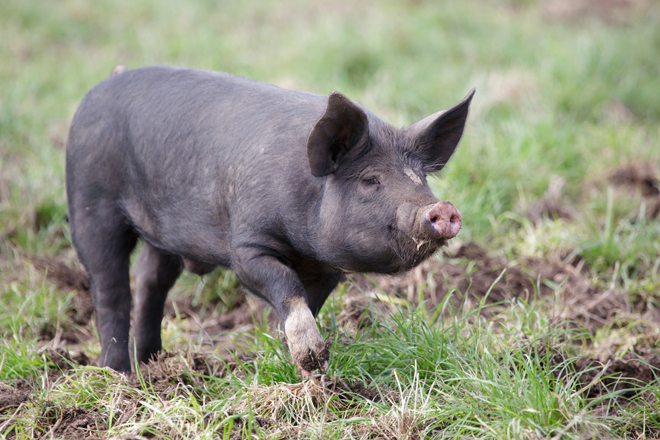 After returning to our starting place and eating a picnic lunch nearby, we walked around the more open farm area and past the Homestead with its well-kept ornamental gardens. Every tree in the apple orchard appeared to be a different heritage variety. Large fluffy chooks pecked about in an enormous heap of compost in their chicken run, which was open to the outside grassed areas, but the attraction inside was too great for many of them to wander. We had seen 46 bird species in the morning and added another four (not counting the chooks) in the afternoon for a nice round 50 species for the day. Thanks to Hazel and Alan for their expert leading. 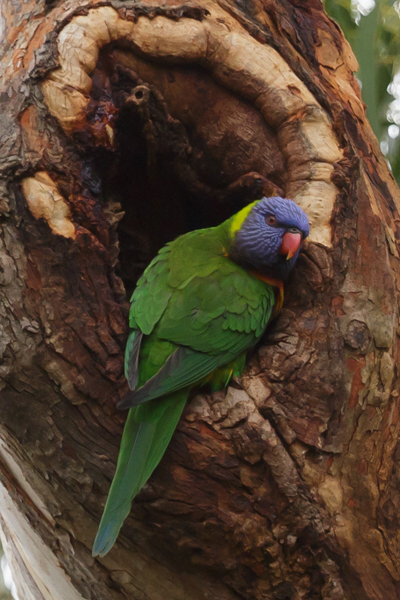 Rainbow Lorikeets checking potential nest hollows. 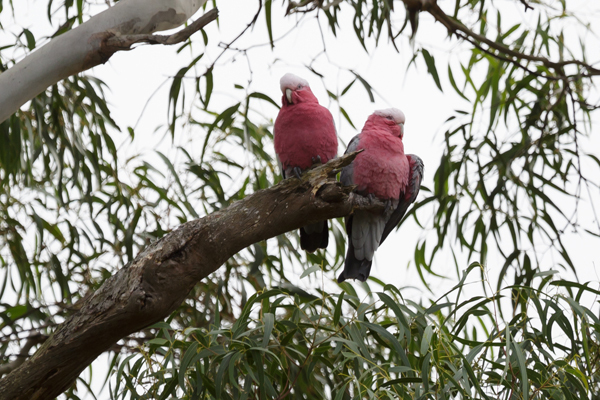 A pair of Galahs: male left (brown eyes), female right (red eyes). Eye colour is a lot easier to see on the larger original.